Castlevania Chronicles[a] is a platform video game developed by Konami for the PlayStation. It is a port of a game originally released for the Sharp X68000 home computer in 1993 as simply Akumajō Dracula. [b] This Castlevania Chronicles port adds a number of features, including an Arranged Mode for new players. Castlevania Chronicles is a remake of the original Castlevania for the Nintendo Entertainment System, where the vampire hunter Simon Belmont must defeat Dracula and save Transylvania. It was made available for download via the PlayStation Network as a PSone Classic on December 18, 2008. Akumajō Dracula is a game based on Castlevania, with a completely new engine designed to take advantage of the Sharp X68000 hardware. The entire game is completely updated, including familiar stages that have been redesigned, as well as brand new stages altogether. It contains all of the special items and sub-weapons from the original game, as well as an exclusive rare item known as the laurel, which refills six health blocks for 10 hearts. This game is also notable for its high difficulty level. Like the original Castlevania game, hidden items worth points and hidden 1-ups will appear throughout the game if the player ducks or stands in particular portions of a level. Another notable feature is the multiple loops after the game is completed. Previous Castlevania games had increased difficulty for the game's second playthrough. An increased amount of damage taken from enemies in earlier levels as well as new enemy placement and attack patterns were just a few things to make the second playthrough more difficult. This game, however, has as many as six additional playthroughs with each one becoming much more difficult than the last. Completing "Arrange Mode" also unlocks special features including an art gallery as well as a "Time Attack Mode". Exclusive to the U.S. and European versions of Chronicles, the art gallery features artwork by Ayami Kojima for Chronicles and Castlevania: Symphony of the Night. The "Time Attack Mode" allows the player to race through any stage, complete with a time meter, to beat their best time. The music for the X68000 game contains a variety of new arrangements of familiar tunes from the series as well as brand new compositions altogether. Before each game, the player is given a choice between three different sound modules: the X68000's FM Synthesizer, MIDI Roland LA (MT-32, CM-32L, CM-64) and MIDI Roland GS (SC-55, SC-33, SC-155, CM-300, CM-500). There is also a hidden General MIDI sound module option that is missing in Castlevania Chronicles. While the soundtrack will remain the same throughout the game regardless of which sound module is chosen, the instrumentation may vary and some songs will be arranged slightly differently. Sōta Fujimori, staff composer for the Konami Corporation in Japan, performed all new arrangements of the soundtrack for Castlevania Chronicles' "Arrange Mode". In the Japanese Chronicles, unlike the US and European versions, the sound hardware selection screen automatically appears before starting a game on "Original Mode" just as it did in Akumajō Dracula (X68000). A code must be entered to reach it in either mode in the U.S. and European versions, while the Japanese version only requires one to be entered in "Arrange Mode". Audio-wise, the Japanese version of Chronicles had slowdown issues with the music playback. These were fixed for the U.S. and European releases. The PlayStation re-release, Castlevania Chronicles, expanded much more to the X68000 game. 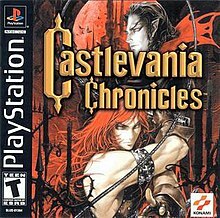 This includes a brand new rendered intro and ending, with new character designs by Ayami Kojima for Simon Belmont and Dracula, improved graphical effects, enhanced music and sound effects, and a more balanced and adjustable difficulty level. Players can choose to play this "Arrange Mode" version of the game with all of the new features intact, or play the "Original Mode" version as it was originally presented on the Sharp X68000. While the "Original Mode" presented on Chronicles is otherwise identical to the X68000 game, there are a few limitations since it is emulated on different hardware. One noticeable difference is the brief loading times that now appear before boss fights and stages. The other drawback is the lack of an internal clock on the PlayStation. The original game utilized the X68000’s internal time and date settings; the time on the clock tower during the boss fight on stage 15 would reflect the X68000’s current time and the color scheme used on the painting in stage 21 would reflect one of the four seasons according to the computer's current date. On the PlayStation game, each time the system is turned on, the time and date have to be manually adjusted only after a hidden "Extra Option" menu is accessed by inputting an altered version of the Konami Code. Exclusive to the U.S. and European versions of Chronicles is an interview with Koji "IGA" Igarashi. Castlevania Chronicles has been met with positive reviews. IGN rated the PlayStation release 7.8, saying it was "a lot of fun". GameSpot gave that same release a 6.1, saying it lacked replay value and was graphically outdated. Game Informer's Tim Turi felt that it wasn't the worst option for people who wanted a classic Castlevania. ^ Konami Computer Entertainment Tokyo (8 October 2001). Castlevania Chronicles. Konami of America, Inc. Scene: title screen, staff credits. ^ Konami (2010-08-04). Castlevania: Harmony of Despair. Konami. Japanese: 歴代の「悪魔城ドラキュラ」シリーズから選ばれた登場キャラクターを操作して、仲間たちと悪魔城に乗り込み、宿敵ドラキュラ伯爵に立ち向かおう。 English translation: Take control of past protagonists from the Castlevania series to brave the Demon Castle alongside friends and defeat the ancient enemy Count Dracula. ^ GameSpot Staff. "The History of Castlevania". GameSpot. Retrieved 2008-10-09. ^ Varanini, Giancarlo (2001-10-01). "Castlevania Chronicles Preview". GameSpot. Retrieved 2008-10-09. ^ "Castlevania Chronicles - The Cutting Room Floor". The Cutting Room Floor. Retrieved 2017-08-03. ^ "Akumajo Dracula Castlevania Chronicles Original Soundtrack". Square Enix Music Online. Retrieved 2013-02-05. ^ a b Varanini, Giancarlo (2001-10-01). "Castlevania Chronicles Preview". GameSpot. Retrieved 2008-10-09. ^ "Castlevania Chronicles Codes". GameSpot. Retrieved 2008-10-09. ^ Thompson, Jon. "Castlevania Chronicles – Review". Allgame. Retrieved August 19, 2013. ^ Varanini, Giancarlo. "Castlevania Review". GameSpot. Archived from the original on August 19, 2013. Retrieved August 19, 2013. ^ a b Smith, David (2001-10-24). "Castlevania Chronicles". IGN. Retrieved 2008-02-07. ^ Varanini, Giancarlo (2001-10-12). "Castlevania Chronicles". GameSpot. Retrieved 2008-02-07. ^ Turi, Tim (2012-04-04). "Ranking The Castlevania Bloodline". Game Informer. Retrieved 2013-12-05. This page was last edited on 5 March 2019, at 05:24 (UTC).